can’t wait for it to end..
Well, that’s exactly what this swap has done to me.. once I saw just how tiny 1″ was.. I groaned, that is, until I began creating these darling pieces .. an addiction has been born! I’ve always love miniature anything, these are no exception. 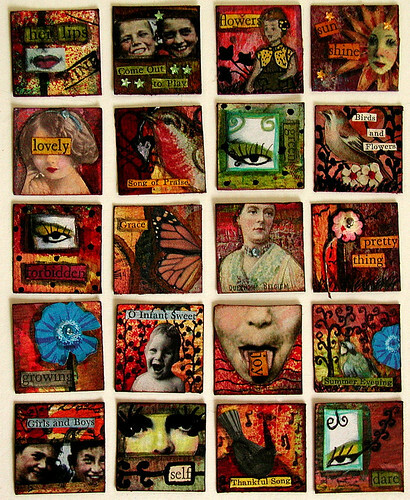 Here’s the scoop .. the swap is through Altered Art Obsession .. hosted by the ingenious TisJewel.. to create 100 ( yes, 100) Original, one of a kind .. 1″ by 1″ collaged squares.. they must be mixed media, each must contain one picture, and at least one word.. Whatcha think about that? Once she swaps ’em out, we will receive 100 squares back, and complete it by creating an accordion book, a 10″ x 10″ piece..or any other creative way to use them, keeping them all in tact and together. All of mine were created on 140lb watercolor paper, with hand painted backgrounds and have inked edges (as i’ve said many a time before a must for a finished look!).. I have all 100 cut, all contain images .. and now I’m in the process of adding embellishments, whimsical hand drawn elements, text, shadows and more.. I’m actually finishing these early for once – as I want them done before my upcoming surgery. Here’s a sneak peek at the first 20 I have completed .. I’ll continue sharing them in batches, as I complete them.. So whatcha think? I’d love to hear your thoughts on them! I’m also open to suggestions, on how to arrange them once I receive them! Is this something anyone can get involved in? Chrysti these are wonderful! I’m in this swap and cannot wait to see which ones of yours I get back!! Ohhhhh, I adore each and every one! You could put them in a tiny tin. i.e. from a package of Starbucks mints or something like that. I have one that might do the trick and would be happy to give it to you. Let me know! Ack. I just reread your post. The tin wouldn’t fit 100 pieces. Hmpf. Back to the drawing board! OMG! These are absolutely Yummy Chrysti!!!! Way to go!!! I love these and I want to play—how do I sign up??? Just beautiful! I love them – how do I join the swap? Wow! Chrysti. This is wonderful. I will definitely have to try this and see what I come up with. Excellent Idea. These are terrific. I must try some of my own to see what I can do. Oh these are gorgeous. I see a new obsession coming on. LOL One of my favorite ways to see small square works of art displayed is as a large work of art; a mosaic! That was my first thought when I started reading this post. :) Oh I love them and now I just have to try it. Wow how fun! These are all so fabulous! I have seen someone do these and wonder how in the world you keep from going cross eyed after doing these lol That would be a major challenge for me to work that small…I have a difficult time working with just atc size lol….is it easier than it looks? I will check out the site! It does look like fun! I love them…I’m drooling over the colors and depth of texture! oh my gosh! I feel exactly the same as you. I’ve only gotten about 22 done so far. It’s tedious but addicting!! come by my blog and see the five I posted. I didn’t want to put up too many but now that you have maybe i will. hee-hee. By the way…I love, love the one with the ruler tongue sticking out. hope I get that one!! VERY cool!! I LOVE what you have done with these!! This sounds like an incredible swap…what fun! Hey! Those are gorgeous! :) Great job! Wow.. what a HUGE redponse to this! Thanks SO much for your encouragement, i finished another batch last night, and will upload them after i get some other stuff caught up! I think I may host a swap similar to this, through my blog.. it’ll be at least a few days, while i set up an info page, and sign- ups..
For those interested in the AAO group — I have it linked in my entry, follow that, and find where it has info to join.. and follow as directed :-)It’s a fabulous group! Andrea — I Had thought of a tin, but folding an accordion book into it..so it popped out when you opened it :-) I’ve also been pondering some sort of mobile.. or a mosaic arrangement on canvas… so many ideas.. I think thats’ it.. did i miss someoen’s question? Nanc — it’s not easy, but it’s fun.. It’s not as hard as i thought it’d be either, i actually find it easier to do a bunch at once, then one at a time.. i did it in steps.. I’ll elaborate ont he next batch i post! Whoo hoo, wow, I didn’t expect that this project would take so much notice! Awesome job Chrysti! For anyone who wants to join AAO, when you go to the yahoo group home page and request to join, you’ll get a questionnaire (it looks daunting, but don’t let it scare you – if you don’t get it let me know). Send that along with artwork examples (if attachments you’ll need to send to me directly as yahoo will delete them), then the review process takes about 1-7 days (on average about 2-3). As you can see we do alot of fun stuff! I adore these little jewels! They are so rich in color! You were gone for so long….I’m very glad you are back into the swing! How FUN Chrysti. I must admit when I read your post I thought…what can you do with 1 inch? WOW you made amazing ART in one inch!! THEY ARE FANTASTIC! Chrysti, these are wonderful . I hope if you do host a swap here that you post it on bmuse so we can join in. great…now look what you’ve done…I really need to do laundry but alas I must now go create tiny collage squares! lol!! I think these are wonderful!! OMG these are just amazing! You have really inspired me. The smaller the space the better, I find it diffiuclt to fill up space. I’ll have to give these a try. Absolutely stunning and inspiring!! I will be joining the AAO Group!! Thanks for sharing!! I look forward to seeing more! I want to play, can’t wait for you to post the swap. Where and when will I find it?? I have trouble cutting with the shape my hands are in, anyone know where to buy the 1 inch squares precut??? What a fabulous idea, Christi!! I love the art you make! je me lance moi aussi dans l’aventure de l’art square! content available for you? I wouldn’t mind composing a post or elaborating on a few of the subjects you write regarding here. Again, awesome website!